Things have started to cool off. Smokey haze has kept the water temps down and the fish pretty happy. 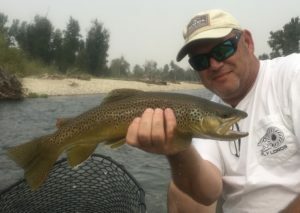 It has still been the best fishing down on the Bitterroot early. Hoppers, Tricos, and the Big Mayfly showing up. Mixing the dropper up can pay off. Blackfoot still a hopper and Trico deal but October caddis should start to appear any day. Temps on the upper Clark Have started to improve they have been staying below 70. But flows are still low, more of a wade option for those that want to avoid boat traffic. Chance of rain later in the week keep your fingers crossed.